I sat next to David's bed in the AIDS hospice the last week of his life and told him that he was a beautiful man. "Thank you," he said, and I closed the door and softly sang hymns he had in the choir. "Take from our lives the strain and stress, and let our ordered lives confess the beauty of thy peace" I sang. The next day David died, and I began experiencing symptoms of care provider burnout first-hand. Twenty years ago in Boston I volunteered for a variety of community-based organizations and at one point was the chair or co-chair of three committees simultaneously at the city's largest Episcopal church. But the demands of meeting the needs of so many others began to take its toll and I stopped volunteering while experiencing great emotional exhaustion. A lack of any feeling of personal accomplishment surfaced. In response to my experiences, and a concept which came to me while meditating, in 1992 I began an educational public charity designed to support and educate care providers. The Health Cares Exchange Initiative, Inc (HCEI) creates supportive networks of caregivers in diverse geographic areas and then educates them about the best ways to provide care for others and, not least important, for themselves. HCEI created its own moderator's guide and hosted the first-ever nationwide focus groups with both paid and non-paid care providers. We use a broad based definition of care provider so it could be a paid or unpaid person - anybody who cares for and about others and gives of their resources and selves. Focus groups held from Kansas to Boston revealed, not surprisingly, that most care providers do not feel supported or celebrated. 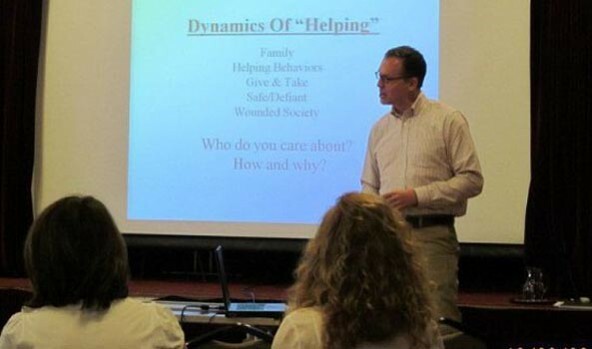 As a result of these focus groups, we developed a dynamic stress management skills building seminar which has been given for thousands of caring persons in the US and UK. The session, which usually lasts 60-90 minutes, encourages participants about ways to identify stressors in their lives and then respond in healthy ways. Audiences have included teachers, clergy, nurses, EMTs, research administrators, advocates, family members, and persons living with chronic conditions. Our first paid seminar was presented to the Kansas Department of Health and Environment in 1998 using a flip chart, magic markers and boom box. I have since spoken at a large number of conferences and I recall many successes and some challenges. Some included: the conference where I looked out and saw an audience member inhaling a helium balloon; the conference where, during a quiet meditation exercise, a marching band began to play in the next room; the conference of funeral planners where I could look out beyond my audience into the exhibit hall to see rows of caskets and glass necklaces with the ashes of your cat (or spouse) inside. Although the majority of people I come into contact with have giving and gentle hearts, some are very wounded or angry. Some people I have invited to network on the Linkedin Internet networking site have "blocked" me from any future contact (am I trying to sell used vacuums?). At one exhibit hall highlighting senior services, I walked from booth to booth introducing myself and collecting business cards. The woman who had coordinated the event called security and asked them to throw me out because I was trying to market my services and had not paid to rent a booth. Several people, listed as designated contacts on the website of their organization, respond to emails from me asking me to take them off my spam list and never contact them again. For a small but unmistakable group of people, something about providing support for care providers can really piss people off. I believe the issue sometimes stirs up deep needs, fears and resentments. And yet should I be surprised at a general lack of support and enthusiasm? A few years ago when I began writing a book version of my workshop, I realized oh my, I have chosen to advocate for a group of people whom (in general) nobody cares for. Perhaps I should be doing stress management for professional athletes or contestants on televised talent shows? Certainly there is great interest and support for those people. And so, in the United States, which espouses individualism rather than collective thought, home to the highest rate of infant mortality for an industrialized nation, and which quite intentionally has no national health plan for its citizens, what sort of support can I reasonably expect? Perhaps in the United Kingdom, where the nation cares for all residents, there would be interest and support for care providers? Because HCEI is a volunteer-based effort, I work at jobs for income and benefits and do this work evenings and weekends. In September 2011, I took a two week vacation and traveled to England and Scotland to visit relatives and see palaces. Using email several months prior to my visit, I contacted dozens of centers for carers in a variety of cities and towns in the UK. I introduced myself and HCEI, and asked them if I could present my seminar when I visited. Four organizations were innovative enough (and brave enough) to build communications and invite me to present. These pioneering groups included Northumbria University, Orkney Carers Center, Derbyshire County Council, and Lancashire County Council. The first seminar was held for a group of family carers at the public library in Kirkwall, Orkney Islands. I knew my seminar was "universal" when I saw heads begin to nod in understanding. The day before I had walked the Ring of Brodgar, a 5,000 year-old Neolithic stone circle, and realized this is a culture that over thousands of years has come to understand how to care about each other. Although seminar participants in the UK were involved with supportive networks for carers, many had never been to a session about compassion fatigue or burnout prevention. I joked that I was becoming their "airplane friend" because for 90 minutes we connected over issues, which were very personal and challenging, and then the next week I would be safely 4,000 miles away! I recall the woman whose parents had died, both unexpectedly, six weeks apart earlier that year, and kept mementos from both on the dashboard of her car. I felt admiration and also concern for the young man who moved into the house with his mother eight years ago after she had a stroke. Surveys given to participants before and after the UK seminars indicated respondent gains of at least 20 percent (at least one point on a scale of 0-5) on three out of four question items. For the question "How well do you identify stress?" the pre-presentation mean was 3.2 and the post-presentation mean was 4.9, a difference of 1.7. When asked "How well do you understand options for responding to stress?" the pre-presentation mean was 2.8 and the post-presentation mean was 4.2, a difference of 1.4. Similar to the hospice movement and national healthcare, the UK appears better coordinated, and willing, to invest resources to care for family carers and others than the US. Seminar participants were extremely involved and appreciative, and appeared to be somewhat more self-sacrificing than those in the US. During one exercise where I asked participants to think of the three people they cared for most, NONE of the UK participants were cheeky enough to list themselves. And in both our Anglo cultures, we all smile through our anger and our disappointments, while our leading cause of death for men and women is cardiovascular related. One thing we have in common, in general, is that we all smile and say no I'm fine, I'm not mad, I don't need anything, thanks. And then our hearts break.Following my trip I began to research the NHS, a daunting task as there is no national health policy in the US for me to compare to. So many changes in structure, authority and leadership, plus I read the electronic Guardian's coverage on social and healthcare. I intend to continue to network and build collaboration in places where care is seen as an important necessity for all. I will continue to give my skills building sessions to groups of paid health and social care providers, administrators and family carers in the UK and beyond. In doing so, the goal is to reduce staff turnover, medical errors and reduce hypertension in most participants. And I have so much to learn! But now I know what mushy peas are. Now I know if I accidentally spill food on my trousers never complain that I've just soiled my pants. My great great grandparents left Durham County, England in 1882 in search of something more. The world and opportunities they were given were not adequate. They did not want to "settle" with the status quo and go without. They had the restlessness and courage to look beyond what they knew and look across oceans for meaning and new life and new hope. Ironically, I am looking east at their land, eager to spend more time, eager to be part of the systems already there, eager to tell nurses and administrators and family carers "well done."